Edgar Degas (1834-1917) is one of the most revered artists of all time, a French Impressionist renowned for his paintings, sculptures, prints and drawings that take the viewer deep into the world of late 19th century Paris. Interested in the psychology and everyday lives of his subjects, Degas is famous for a number of recurring themes in his work, foremost among them the subject of dance and ballet, in particular. Indeed, more than half of his works depict dancers. Degas was the most eclectic of the Impressionists, however, both in the diversity of his subject matter and in his experimentation with various manners and techniques. With work by Degas in many media — from print and monotype to sculpture and drawing — and exploring his interests in all arenas of French life, this show highlights Degas’ prodigiousness and exquisite draftsmanship. 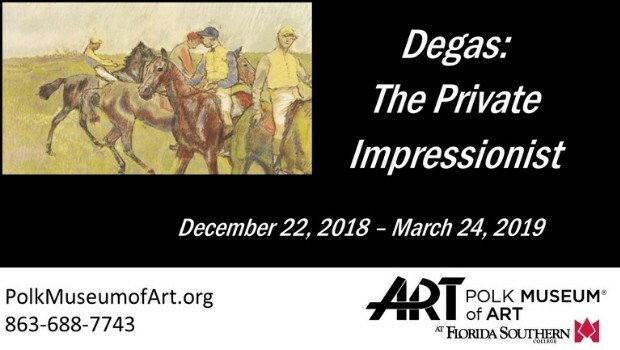 The exhibition Degas: The Private Impressionist reveals the artist’s particular masterly in depicting lifelike movement, as seen in his rendition of dancers, racecourse subjects, and female nudes. The exhibition is comprised of works from a private collection and seeks to shed light not only on the artist’s favorite themes but also on the complex man himself and the artists he called his friends. Indeed, beyond the work of Degas, the show also boasts more than forty additional works on paper by Degas’ artist friends and colleagues, including Mary Cassatt, Paul Cézanne, Jean-Auguste-Dominque Ingres, and Henri de Toulouse-Lautrec.